This is a summary for Brinley from 5 years 5 months to 5 years 6 months. All is well with sleep. We let Brinley read some books in her bed after we put her to bed. So far, we just tell her how many books she can look at before going to sleep. We let all of our children do this. With Brayden (now 12), we have always just let him decide how long. He is very concerned about getting enough sleep and has really good self control with stopping a book to go to bed (which is more than I can say for myself…or especially my husband. He read Harry Potter 8 all in one night without sleeping and then went straight to work). With Kaitlyn (now 10), we also let her monitor herself, but remind her that she needs to stop reading and go to bed at a good time. With McKenna (now 8), we give her a time to turn lights out. She is more of a “live in the moment” type and would continue reading until her current book was done if we did not give her a time. We had parent teacher conferences this month. Brinley is doing very well in school. She is still getting strikes at times. This is something I do not like. I haven’t had a child who got in trouble consistently at school before. Her teacher did assure me that it isn’t that bad. 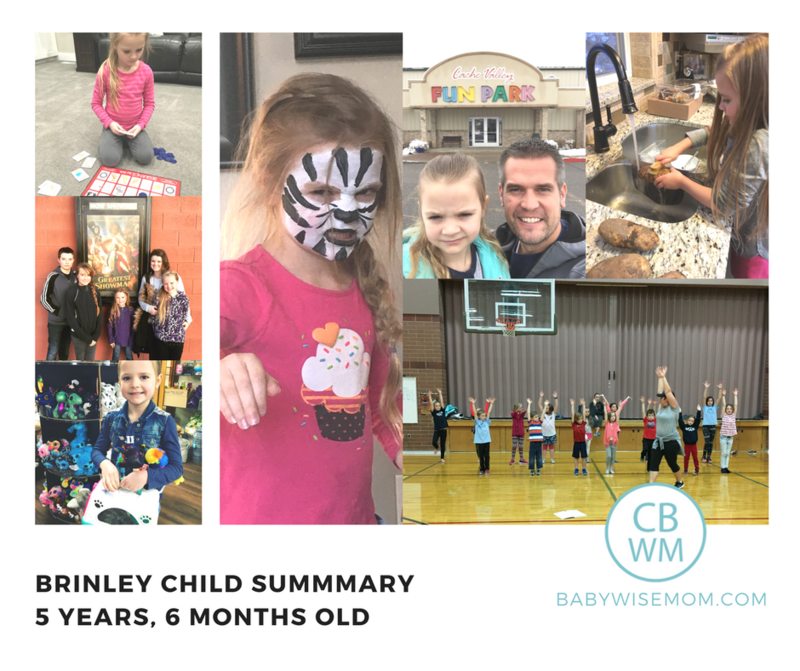 Brinley gets a strike for talking out–saying the answer without getting called on. This is a problem in a classroom setting because she knows the answer quickly and it doesn’t give the other children a chance to figure the answer out themselves. She will also get a strike for moving too many times on the rug. They are allowed to move from their spot one time to a new one, but she will do it more than once. I would say Brinley definitely has a hard time with self-control. I suspect she has some very real OCD, and when her mind gets set on something, she has a very hard time not acting on it. This isn’t in a “strong-willed” child way. You might remember that McKenna is my strong-willed child and this isn’t like that. This isn’t a stubbornness. It is really a laser-beam focus. If she wants a question answered, she cannot help but ask it a billion times until it is answered. If she is excited to go somewhere, she will ask all day long until you go. If you have ever watched the Big Bang Theory, she reminds me of Sheldon needing to knock three times every time he knocks. She gets compulsive like that. So I have tried to help her learn to be flexible and patient. If she asks too many times about something, I tell her if she asks again, the answer will be no. And I follow through. That has helped her learn to not ask over and over and over and over. We have also started doing sitting practice. I have her sit on a chair. She has to sit totally still and say nothing. I set the timer for two minutes. If she moves or talks, I reset the timer. Once it goes off, she can move again. She is also working on hand-folding when she needs to control herself but is having a hard time doing so. Swimming lessons: things are going very, very well with swimming. She is progressing nicely. Gymnastics: she loves gymnastics. She is getting braver all the time about the balance beam (She is afraid of heights, so the balance beam is scary for her. Musical: The musical is going well, now, bur rehearsals started out rough. She did not seem to want to be there–at least not if it meant she needed to sit still. I had to make a rule that if she didn’t participate as she should (sitting still, following choreography, etc. ), she would lose video game time. That changed her attitude.